It surprises me that after tearing down the track after a lure the dogs still want to run back to the starting point. They're all so well-behaved about it, they don't run amok in the field, they know to come back to their people. Even Frankie is a little angel about it; I take pictures as he runs past and at the end he turns around and comes back to me. We walk together, side-by-side, while he cools off and then he goes off to relax in the shade while the other dogs run. The only flaw is that he has to be in a pen or run because otherwise he would be back chasing the lure. Still, he's a good boy. 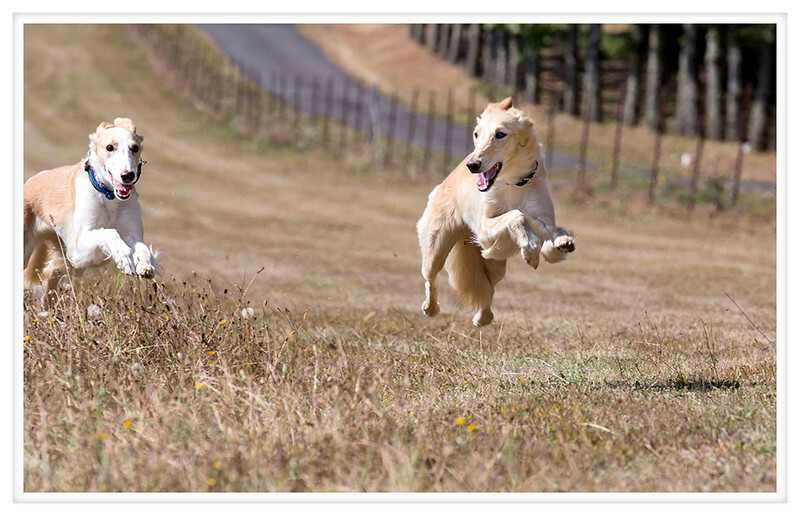 Below is Frankie's sister Sky on the left running with cousin Randi on the right.